GRAZ, Austria – This blog post has nothing to do with the dateline of Graz, the second-biggest city in Austria where I happen to be for the weekend. On the other hand, maybe it does. This blog has rarely been so out of date – I mean, I went to an open mic on Sunday night and reported on it on Tuesday night. Now, I am reporting on an open mic that I attended on Monday, and we’re already Thursday. What does this all mean? It means that I hate being late with such reports, but I do feel 1) the cliché, better late than never, and 2) that I have the excuse of writing a bunch of articles for my weekend Formula One report for the Austrian Grand Prix; traveling to Austria and preparing to travel to Austria; going to see a very funny comedian – David Azencot – perform his show on a boat last night in Paris; and having had some great news that occupied me for a while as I read it over, spread that news on various social media, and basked in the moment rather than reporting on my night at the Galway open mic. That great news was that a couple of days ago a fabulous music web site featured my music, and more specifically my song and video of “Crazy Lady,” in a regular column it runs called “Music Under the Radar.” The site is called Ben Cisco’s World of Music, and it reflects a vast cross-section of musical tastes and styles in a huge collection of different columns and features. I shared the three-part spotlight with some fabulous musicians, an eclectic group completely different to me – i.e., guitarist Raymond DiGiorgio and a British woman named Jazz Mino, whose song, “The Dorkiness in You” seems to be turning into a YouTube hit, and not surprisingly so. But I’ll stop talking about it and suggest you click on the above link to see the story…. 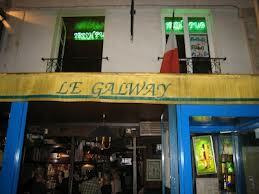 Because in any case, my real purpose here was to write about my evening at the Galway Pub open mic in Paris. I have not been to the Galway for quite a while – compared to my weekly visits of recent years – and so I was wonderfully reassured to find that it has not simply not lost any of its fun and lightness and warmth, but it has vastly gained in all those areas. Or maybe it was just a good night. In any case, there were a number of interesting musicians, and there were so many of them that I was pleased the format was reduced to just two songs each – it has often been four songs in the past – so that I could play at a reasonable hour, despite being 10th on the list. Well, that’s not much said about the Galway, but it is four days late…. I’ll try to get back to my usual promptness in reporting life in the open mics around the world. Keep tuned in the coming days for something about Graz, Austria, by the way….